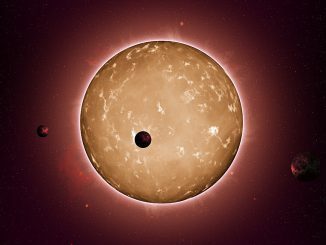 Did the young Sun steal Planet 9 from another star? 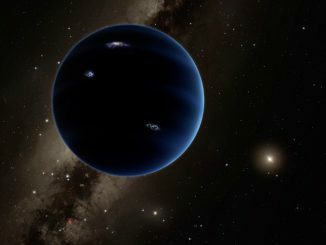 Through a computer-simulated study, astronomers at Lund University in Sweden show that it is highly likely the so-called Planet 9 is an exoplanet. This would make it the first such body to be discovered inside our own solar system — when or if it is found. The theory is that our Sun, in its youth some 4.5 billion years ago, stole Planet 9 from its original star. 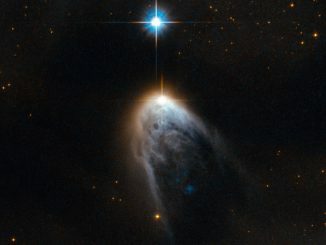 In this NASA/ESA Hubble Space Telescope image, we see a young star breaking out. The golden veil of light cloaks a young stellar object known only as IRAS 14568-6304 in the Circinus molecular cloud complex. This stellar newborn is ejecting gas at supersonic speeds and eventually will have cleared a hole in the cloud, allowing it to be easily visible to the outside universe. 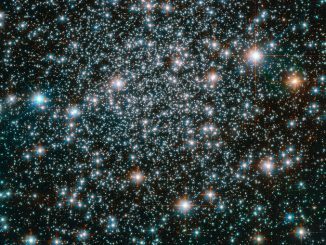 This 10.5-billion-year-old globular cluster, NGC 6496, is home to heavy-metal stars of a celestial kind! The stars comprising this spectacular spherical cluster are enriched with much higher proportions of metals (in astronomy, elements heavier than hydrogen and helium are curiously known as metals) than stars found in similar clusters. On the evening of Monday, 30 May, Mars is closer to Earth than at any time since 30 October 2005. This begs the question: just how close can Mars get? Ade Ashford gives you an overview of close Martian oppositions past, present and future. 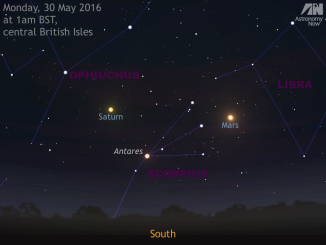 Also, Friday, 3 June sees the opposition of Saturn, the other planet visible low in the south around midnight. A mosaic strip just released by the New Horizons team now includes all of the highest-resolution images taken by the NASA probe. 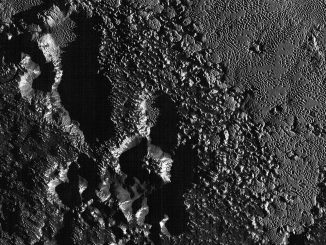 The mosaic affords scientists and the public the best opportunity to examine the fine details of the various types of terrain on Pluto, and determine the processes that formed and shaped them. The possibility that water and organic molecules were brought to the early Earth through cometary impacts has long been the subject of important debate. 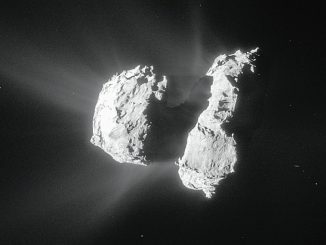 Now, ingredients crucial for the origin of life on Earth, including the simple amino acid glycine and phosphorus — key components of DNA and cell membranes — have been discovered at Comet 67P/Churyumov-Gerasimenko. 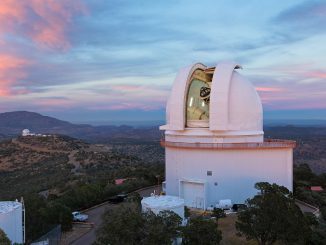 Contradicting the long-standing idea that large Jupiter-mass planets take a minimum of 10 million years to form, astronomers have just announced the discovery of a giant planet in close orbit around a 2 million-year-old star that still retains a disc of circumstellar gas and dust. CI Tau b is at least eight times larger than Jupiter and 450 light-years from Earth. 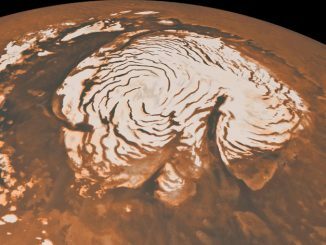 Using radar data collected by NASA’s Mars Reconnaissance Orbiter, researchers have found evidence of an ice age recorded in the polar deposits of Mars. Measurements show that about 87,000 cubic kilometres of ice have accumulated at the poles since the end of the last ice age about 370,000 years ago; the majority of the material accumulated at the Martian north pole. 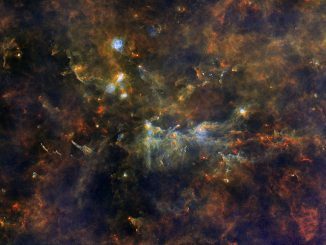 This infrared image from ESA’s Herschel Space Observatory shows the region known as Vulpecula OB1, a ‘stellar association’ in which a batch of truly giant ‘OB’ stars is being born 8,000 light-years away in the constellation of Vulpecula (The Little Fox). There is enough material here to build stars for millions of years to come.